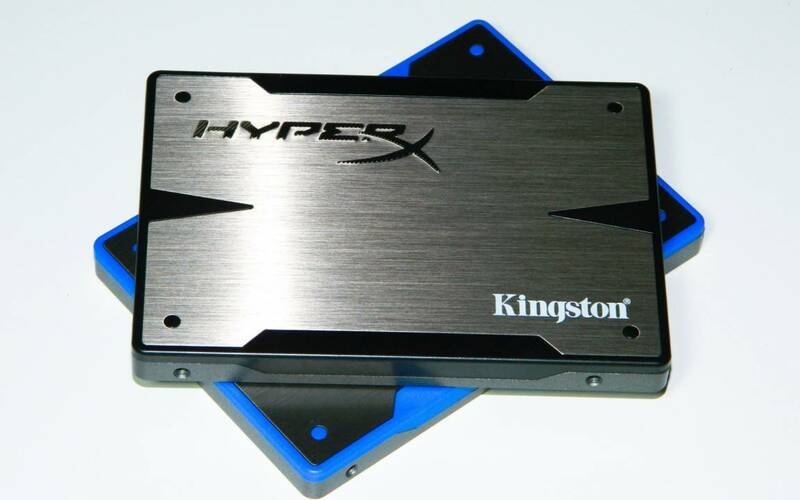 A few months ago, we awarded the Kingston HyperX series SSDs an Editors' Choice Award for very sound reasons: great performance, excellent firmware, and a great upgrade bundle. All of this helps ensure that you benefit from the full SSD experience. Then, Kingston released another winning choice in the surprisingly affordable V+200 Enterprise SSD. Because it uses less expensive 3K synchronous NAND, and didn't sacrifice on performance, it also earned our top honors. 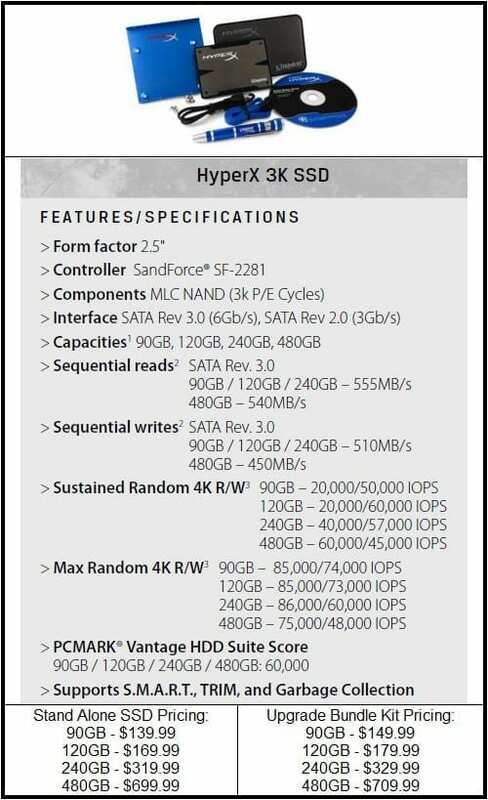 That brings us to the new HyperX 3K SSD. 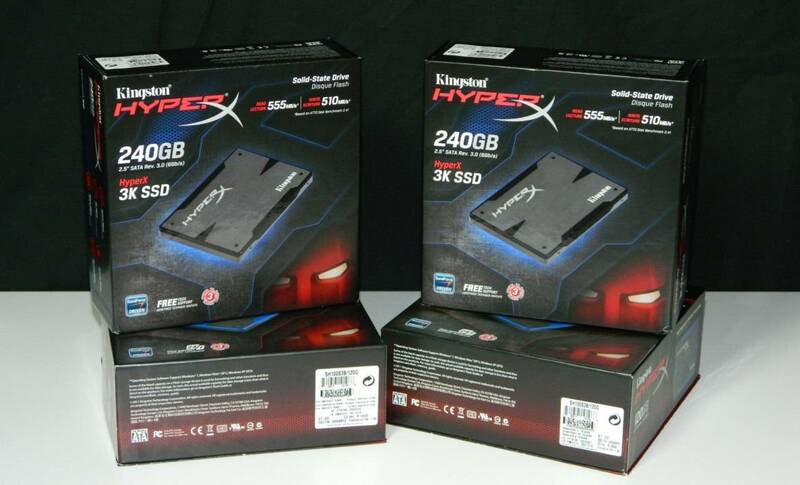 The HyperX 3K is a combination of both award winning SSDs. This new drive comes in a black on gun metal aluminum theme and looks great. It offers 3K MLC synchronous NAND to save costs, but still offers high performance. Plus, you can buy them in both stand alone and upgrade kits. We have a pair of them that are screaming to be cut loose on the test bench so let's get to work! 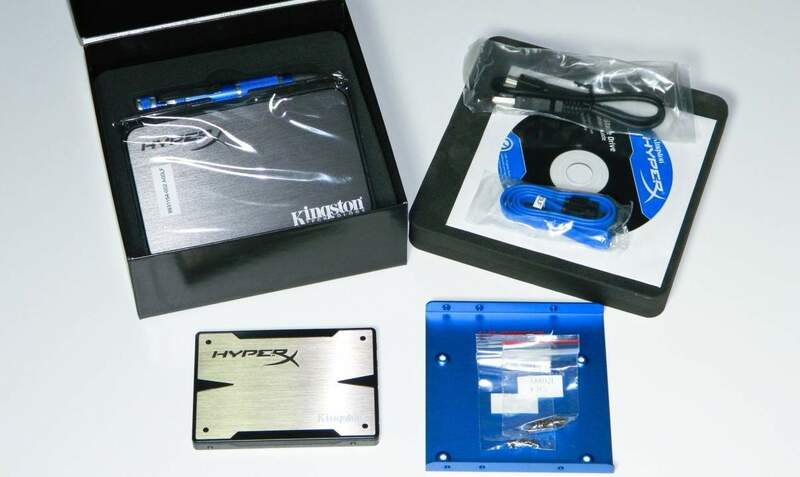 The new HyperX 3K SSD (featured prior to launch in our recent Kingston Interview) series is just a taste of the things coming down the assembly line. NAND durability and reliability are still two factors users are keeping an eye on especially given the monetary investment. Using 3K synchronous MLC NAND helps extend the life of the cells while keeping costs down. Kingston's SSDs carry a 3 year warranty across the board so there is no fear. 3K NAND adds a level of reliability to professional use in the V+200 Enterprise series and it is a good choice for the HyperX edition too. With the exception of the NAND and capacities, the HyperX 3K specs are very similar to the original HyperX blue. Both offer up to 555MB/s read and 510MB/s write performance. The 3K series adds a 90GB model mostly because 90GB provides a good workstation price to performance ratio. Keep in mind that your particular chipset, system configuration and HBA or RAID card will effect performance as controllers make all the difference. Pricing is the next concern. The Upgrade Bundle Kit is only $10 US/CA on average more than the stand alone package which brings me to a logical recommendation. It's my humble analytical opinion that the kit alone is absolutely worth the extra money. Let me show you why next. What's in the Upgrade Bundle Kit? This isn't your regular mismatched pile of cables and pointless accessories often used to make it look like you're getting a good value. Everything in the Upgrade Kit is very usable, especially the Acronis software. There is a data cable, external USB SSD enclosure, 3.5" HyperX mounting bracket, HyperX screwdriver and Acronis True Image software disc. Acronis True Image CD is bootable and allows users to backup, clean, manage and clone the data from your existing bootable storage drive to the SSD. It comes in very handy in that respect and saves you from having to reinstall everything. That's a lot of time saved right there and totally worth that extra $10 bucks. I've used it over two dozen times in the lab and highly recommend you get the Upgrade Kit, if you don't already have a bundle kit at your disposal. For testing, we're moving to a new MSI Z77A-GD65 motherboard. The Z68 is still quite good in terms of chipset and Intel enterprise controller implementation but the Z77 is very similar at heart in that it shares the same controllers with a bit more PCIE bus bandwidth since the test system is in an SLI configuration for another mission. Plus, the MSI Z77A-GD65 is a very solid platform. Since the native Z77 chipset is the faster storage solution on the platform, I'm only using the SATA3 ports. BIOS options were set to RAID0. Intel Rapid Storage was installed to better support the chipset controller. Single and RAID SSD configurations were tested. Starting things off, we have PCMark7 which is a whole system benchmark based on office productivity performance. While not completely optimized for SSDs, PCMark7 does still reflect system benefits when compared to platter based hard drives. The system is far more efficient thanks to the SSD. Here are the results. 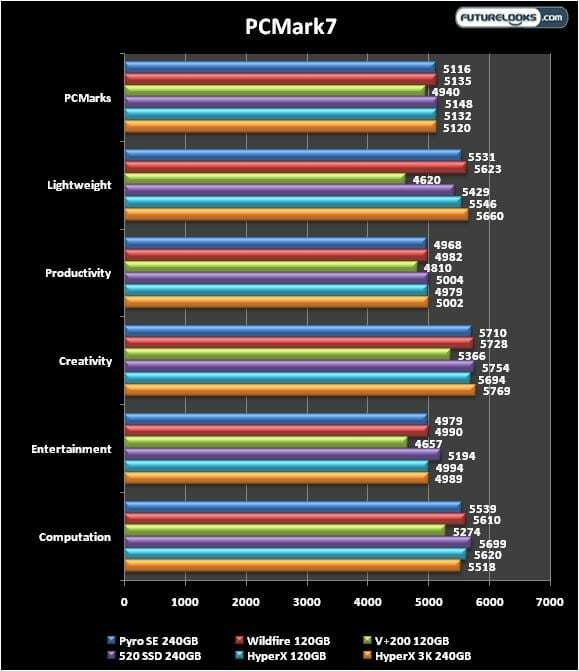 As you can see, SSD scores are noticeably better. The HyperX 3K doesn't quite lead the pack but it's right there with the best that often costs more. The interesting thing is that the score was pretty much the same whether in single or RAID0 configuration. RAID has other benefits which you'll see soon.